Edge grinding machine - SHIRAI TECH, LIMITED. 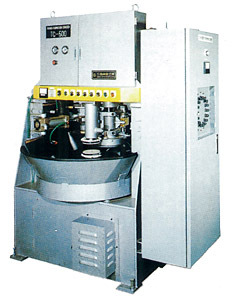 This is a profile grinding type machine, which allows mass production of uniformly-shaped products. Processing tact time for 1 product is 10 ~ 15 seconds (For 3mm ~ 5mm-thick glass). This machine simultaneously performs edge beveling and top/bottom chamfering (aris) on the glass. This machine is perfect for processing the front glass plates used in microwaves, oven toasters, etc. Easy operability, water-proof, and durable to ensure long machine life. 16-speed adjuster unit can also be installed (Optional part). MIN. 200mm, MAX. 500mm (diagonal length), Others: 1300mm (diagonal length).